Melody Leary was born and raised in southeastern Connecticut. While at the Hartford Art School, Leary majored in art education and went on to teach high school art for the next 35 years. An artist with a lifelong passion for printmaking, Leary has shared this enthusiasm with hundreds of students. 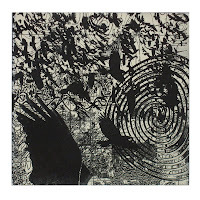 Largely self-taught, her interest in printmaking evolved over many years as she experimented with various methods including; relief, intaglio, lithography, silkscreen, collagraphs, monotypes and less toxic processes that include photopolymer techniques. 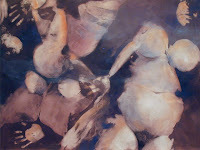 Leary’s work has been exhibited throughout the northeast and juried shows throughout the country. Believe it or not, I vividly remember my first linocut while in elementary school. Loved everything about it and wished I could do more. In high school I had the opportunity to do a couple of additional relief prints using wood & linoleum as well as monotypes and silkscreen. Every time I had the opportunity to use ink, I was happy. After college I decided to delve into the world of printmaking on my own and haven’t looked back! For me, making a print means engaging in a private discourse with the work, through its countless transformations, in an attempt to evoke for myself some unexpected vision. As a printmaker, this exchange is sometimes made visible as working proofs are successively pulled from a plate. The results enable me to see, simultaneously, the original grasping of an idea and its subsequent exploration, including the discarding or reworking of images. I am extremely fortunate to have a 20 X 30’ studio space. My husband added it as an addition to our home and it has windows on 3 sides looking out over the treetops. It is equipped with a Rembrandt Graphic Arts elephant press that I was fortunate enough to find second had for a great price. What's your favourite printmaking process? It is difficult for me to choose a favorite process because I like each for different reasons. 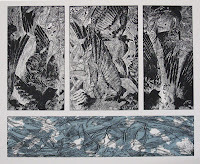 My first love was collagraphs for their rich textures and the sculptural nature of creating the plate. The graphic nature of black & white relief prints always draw my attention, numerous ways of working in intaglio are endlessly fascinating, the layering of colors and textures while creating a silkscreen is exciting, and combining any and all processes rich with layers and mystery. I am currently focusing my efforts on photopolymer processes after having taken a workshop with Keith Howard back in ’95 in Peace River Alberta. I start out with a general idea that I seek to visualize then use sketches to work out the overall concept and composition. I reference my photographs, not for directly taking a picture and re-creating it, but rather as a starting place. More often than not, I create something that is quite different, but the photos are just a launching point. Once I’m happy with the image I determine which print technique will be best suited to the image and what I’m trying to convey. Sometimes I jump in and work directly on a plate or surface, building as I go and other times I work from a drawing transferred onto the plate. For linocuts or woodcuts I usually have the design worked out before I start. With monotypes or etching, once I start the piece, it can change direction as I work as I leave myself open to unexpected opportunities. What do you enjoy most about printmaking? Everything. The smell of the inks, the energy involved in working the plate, the feel of the paper and of course the magic of the press all play a role in printmaking’s allure. Like art itself, printmaking is about discovery, experimentation and process. Ultimately, it is the process that draws me to the medium; figuring out what I want in an image and then creating the circumstances and processes to achieve that goal. Printmaking is loaded with creative problems, and part of the passion it inspires is finding the best possible creative solution to satisfy a visual problem. There are always new challenges to be met and unlimited possibilities. At the end of a printing session, it is always magical to find out what lies beneath the blankets. What's your least favorite part of the process? Believe it or not, getting started on a new project when I have all of these ideas and I need to decide which road to take. With so many opportunities I become so indecisive that I end up finding other things to do, like housework, yard-work, etc. However, once I step into the studio and start working, I resent all those mundane tasks that take time away from my work and end up craving all the studio time I can manage. What are your inspirations (other artists, people, places, events, etc.)? Nature, the environment, just my everyday surroundings and life in general are my inspiration. Sometimes I work on a piece for weeks, but I cannot explain what I am searching for, or for that matter, what is finally resolved. I can site the sources for some of the imagery, but I am at a loss to say why those resonate within me in the first place. I know I am not interested in producing an art of purely formal concerns, but neither am I at peace with work bent solely on representation; I’m caught between the formal, the representational and the expressionist content. This exchange, which is often unconscious, leads me to unexpected revelations about feelings and ideas. The essence of art making for me is that each time a viewer is engaged by a work, the creative process is regenerated through the language of the work itself, for which there can be no translation. How has your work changed and evolved since you started? Printmaking makes you think in steps; the development of the image, the creation of the plate, the inking process all make you slow down and consider your various options. It also teaches you to be open to unexpected outcomes and encourages experimentation as those options become more familiar. 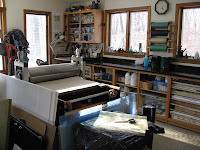 I am also much more aware of the many hazards of traditional printmaking and have made efforts to use less toxic materials, processes and techniques whenever possible. How do you get past creative slumps? I play around with photography and take lots of shots for reference material. Also, I turn to my sketchbook when I’m in a creative slump and find that sketching keeps me in a creative mode. Visiting museums and galleries and lots of reading also helps. You never know what will spark an idea for a new print and sometimes you just need to take a break from things and let ideas “ferment”. Recently, I’ve been putting my work up on various websites to develop an online presence; MyArtSpace.com, Art House Co Op, and Etsy to name a few. One of my favorites is Inkteraction, a wonderful site for printmakers. I’ve also created a blog to journal my studio work. It’s also important to participate in local exhibitions and various exchange projects. Any other comments or advice for others who want to try making hand-pulled prints? A print is simply an indentation or mark on a surface left by the pressure of an object brought into contact with it. Given a few stencils or some rubber stamps and ink, anyone could make a print. Start experimenting with some basic monotypes. Simply inking up objects and pressing them to a surface can produce wonderful results with a minimum of equipment. Basic relief techniques such as linoleum prints or woodcuts can be easily explored; and keep in mind that there are great books available that will guide you through a process step by step. Gorgeous work, Melody!! Welcome to Printsy... looking forward to seeing more of your work! Melody is a talented hard working printmaker - its good to see this interview about her work!! !